Kitchen Window: The Stars Come Out For Holiday Bakers What's cozier than curling up by a window on a starry night, watching a few starry flakes of snow drifting down, nibbling the sugary points of a star cookie one by one? Nibbling three different types of star cookies! 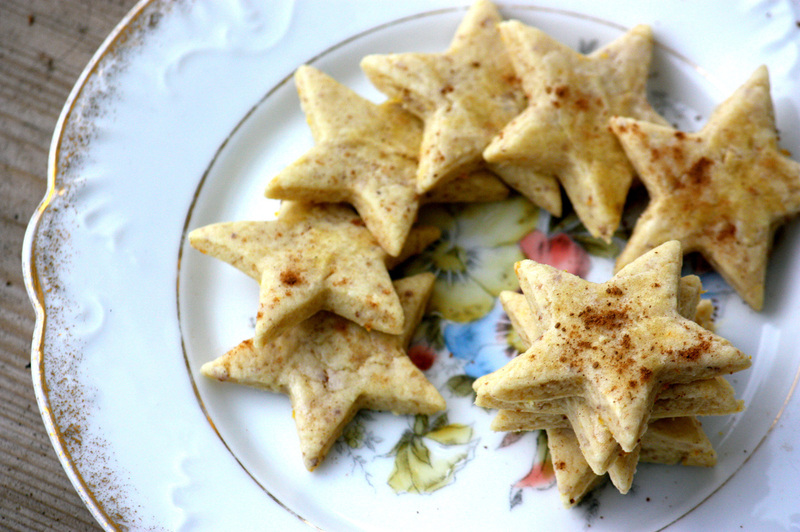 Get recipes for La Befana's Stars, Linzer Stars and Alsatian Christmas Cinnamon Stars (Himmelgestirn). As a young woman, I had an attack of nostalgia for a possibly imaginary cookie. It was prompted by a walk up New York's Third Avenue, where I saw in the bakery case of a local delicatessen a stack of small round cookies, covered in the tiny rainbow sprinkles known as nonpareils. Instantly, I was ambushed by a flashback to the tiny Italian pastry shop of the small riverside town just north of Manhattan where I grew up, and where, I felt sure, I had been given star-shaped sprinkle cookies of a similar kind as a reward for my excellent behavior. I can think of few things cozier than curling up by a window on a starry night ... and nibbling the sugary points of your star cookie one by one. The cookies, the reward and certainly the behavior all seem equally unlikely to me in retrospect. 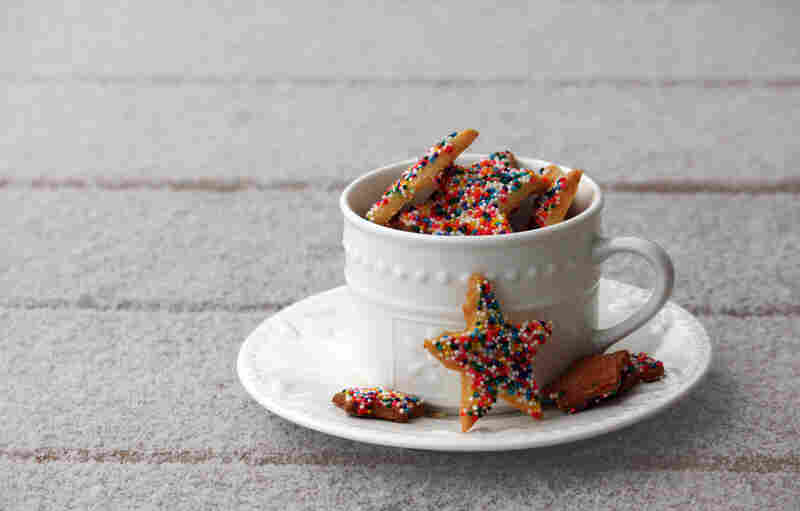 But my longing for a star-shaped sprinkle cookie proved durable, and that is why I found myself, one December night not long after the deli sighting, hastily trying to re-create the imaginary cookie before a holiday party I was supposed to attend. Like most emergency baking undertaken by novices, this did not go well. My recipe was a butter cookie recipe from the stack of Gourmet magazines lying next to the phone. Since my butter was rock-hard from the fridge, I decided to warm it up by laying it next to the radiator. Predictably, the first stick simply melted. The second fared better, and I managed to produce a sticky, soft dough. Lacking the time to chill it in the fridge, I cracked the window to the arctic outside air and tried to roll it out right there in the ensuing draft. My fingers were freezing, but the dough barely noticed. In no time, it was sticking to the rolling pin and my hands, while the window seat and my party clothes were covered in the flour I was attempting to use as an un-sticker. I'm not sure I even made it to the party, in the end. I gave up trying to make sprinkle cookies. Instead, I took to buying them from that Third Avenue deli — only 4 or 5 at a time, because they were exorbitantly expensive. I confess I tried to make them last by eating them only with my incisors. T. Susan Chang regularly reviews cookbooks for The Boston Globe, NPR.org and the cookbook-indexing website Eat Your Books. She's the author of A Spoonful of Promises: Recipes and Stories From a Well-Tempered Table and has just released the CookShelf cookbook-rating app, which is available on iPhone, iPad and Android devices. For more information, visit her blog, Cookbooks for Dinner. Fifteen years, three job changes and two children later, I stumbled across a recipe for "La Befana's stars" in pastry chef Gina De Palma's Dolce Italiano (Norton, 2007). Ignoring the familiar wave of ersatz nostalgia that instantly beset me, I tied on an apron and got to work. La Befana is an Epiphany figure (try getting your toddler to say "Epiphany," and you'll see where her name comes from). According to one version, the Magi stopped at her house on their way to Bethlehem. In return for her hospitality, they invited her to join them, but she preferred to stay home. Some days later, she was struck by regret and set out, toys in hand, to try to catch up with them. She never did, but on the day before Epiphany, Jan. 5, La Befana gives her toys to good children, along with the usual lump of coal for the not-so-good. The star-shaped cookie? It's that same star that the Magi followed, although I have no idea how the sprinkles come into it. Whether you think the star is the star of Bethlehem or an ordinary gold star, like the one your childhood teachers gave out for excellent effort, there's something just right about eating star cookies at Christmastime. I like to think of the sound of sprinkles bouncing on a sheet pan as the sound of tiny, tiny sleigh bells. And I can think of few things cozier than curling up by a window on a starry night, or watching a few starry flakes of snow drifting down from a passing cloud, and nibbling the sugary points of your star cookie one by one, maybe with just your incisors. My mother, unlike La Befana, may not have handed out sprinkle stars for good behavior. But I am neither my mother nor an ancient Italian fairy godmother, and I hand out sprinkle stars for pretty much any behavior. As for myself, I eat them before Christmas, and I eat them on Christmas as well as on La Befana's day, Jan. 5. To be honest, I generally continue to eat them straight through until March. Because after all — most of the time — I really am very, very good. This recipe, adapted from Dolce Italiano (Norton, 2007) by Gina de Palma, yields quite a lot of dough, and you can re-roll scraps practically ad infinitum. So I generally either halve the recipe or freeze the remainder once I've made several batches. Or, if you don't mind having a mere dusting of sprinkles on each cookie, you can just shake sprinkles with abandon over the glazed cookies while they're already in the pan. In a medium bowl, whisk the flour, baking powder and salt together and set aside. In the bowl of an electric mixer fitted with the paddle attachment, cream the butter and sugar together on medium speed until creamy and light, about 2 minutes. Beat in the egg and 2 of the egg yolks, one at a time, scraping down the sides after each addition, followed by the vanilla extract, anisette and orange zest. Beat in the dry ingredients on low speed to form a stiff dough. Remove the dough from the bowl, flatten it into a disk, wrap it in plastic and chill until it is firm enough to roll, about 1 hour. Preheat the oven to 350 degrees. Lightly grease 2 baking sheets with nonstick cooking spray or butter, or line them with parchment paper. Divide the dough into 3 equal pieces; work with 1 piece at a time, keeping the remaining pieces refrigerated. On a floured surface, roll the dough to a thickness of 1/8 inch. 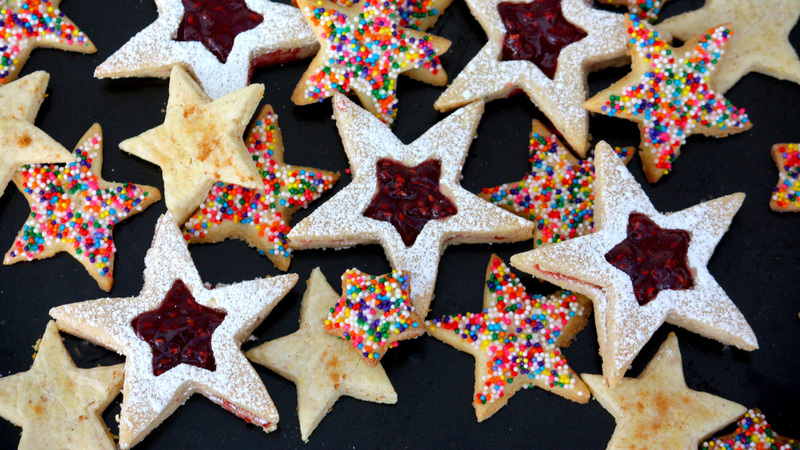 Using a floured star-shaped cookie cutter, cut the dough into stars. Place the cookies 1/2 inch apart on the baking sheets. Gather the scraps together and repeat rolling and cutting until you have used all the scraps; it may be necessary to refrigerate the scraps until they are firm enough to roll again. To make the glaze: In a small bowl, whisk the remaining egg yolk with the cream. Using a small pastry brush, lightly brush the surface of the cookies with a bit of glaze and decorate them with the sprinkles. Bake the cookies until they are lightly golden brown, 12 to 14 minutes (check after 10), rotating the baking sheets 180 degrees halfway through the baking time to ensure even browning. Allow the cookies to cool slightly on the baking sheets, then gently remove them with a spatula to a wire rack to cool completely. The cookies can be stored in an airtight container, layered between sheets of parchment paper, for up to 4 days. These come from my neighbor Dédé Wilson's A Baker's Field Guide to Christmas Cookies (Harvard Common Press, 2011), a good resource at this time of year. If you have a really large Cuisinart, this is a good time to use it, as the standard 7-cup size is a pretty tight fit for so much dough. Pulse the flour, nuts, granulated sugar, cinnamon, cloves and salt together in a food processor until nuts are finely ground. With machine on, add butter a few pieces at a time through feed tube and process until evenly combined. Pulse in almond extract and lemon zest until mixture begins to form large, moist clumps. Scrape dough onto a large piece of plastic wrap, form into 2 very flat discs, cover completely with plastic wrap and refrigerate until firm enough to roll out, at least 2 hours or overnight. Preheat oven to 325 degrees. Line 2 cookie sheets with parchment paper. Roll 1 disc out to 1⁄4-inch thickness on floured surface; you may need to flour the pin too. Cut out large stars and place at least 1 inch apart on cookie sheet. Cut out a small star from the center of half the cookies and place on separate cookie sheet. Repeat with remaining dough. On the day of serving, place jam in a small bowl and stir until smooth. 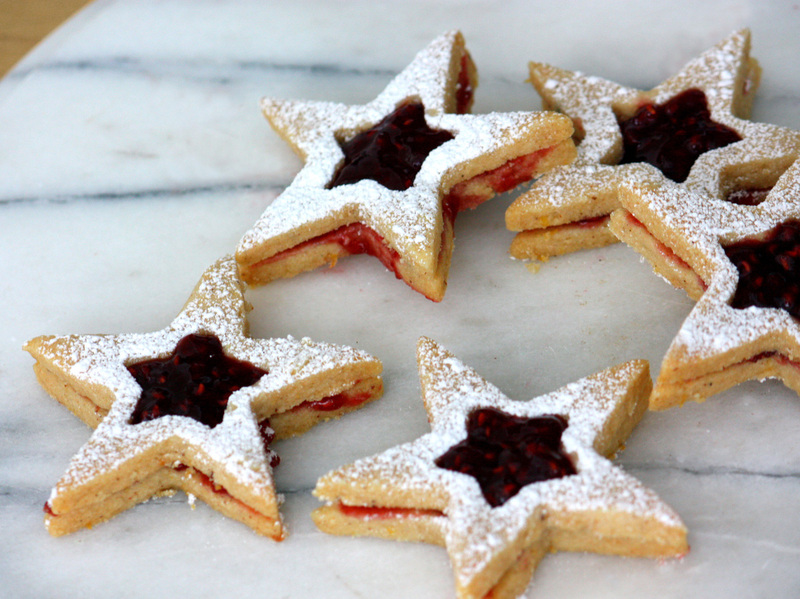 Using a small offset spatula, spread a thin layer of jam on the flat bottoms of the large solid star cookies and on the bottom of half the small star cookies; you will have some jam left over. Place large cutout star cookies and remaining small stars on cookie sheet, top side up. Use a fine-mesh strainer to sieve confectioners' sugar over them. Carefully sandwich the cookie tops with cookie bottoms, large stars with large and small with small, confectioners' sugar side up. Small stars are ready to eat. For larger stars, place remaining jam in parchment paper cone, snip off the tip and carefully pipe into star-shaped windows to fill up the cutout space. The late Richard Sax left behind a treasure in the form of Classic Home Desserts (Houghton Mifflin Harcourt 1994, reissued 2010). These delicate stars are simple and fragrant. You can halve the recipe (how do you split 1 egg? Beat it lightly and use half for the cookie and half for the glaze). If you are grinding your own almonds, remember that 1 cup of whole nuts is not the same as 1 cup of ground nuts, so measure after grinding. I found 1 1/4 cups of whole nuts translated to 2 cups of almond meal. With an electric mixer at medium speed, cream the butter with the sugar just until well combined. Add the almonds and egg and beat until light. Add the cinnamon, orange, lemon zest and kirsch or other spirit; beat until smooth. In a small bowl, stir together the flour and baking powder. Add to the butter mixture and mix just until combined, no longer. Wrap the dough in plastic wrap and refrigerate until quite firm, at least 1 hour. Preheat oven to 350 degrees. Lightly butter 2 or 3 baking sheets; set aside. Working with about 1/4 of the dough at a time and keeping the remainder refrigerated, roll out the dough on lightly floured surface to a thickness of slightly less than 1/4 inch. With a cutter, cut out stars or other shapes. Place the cookies on the prepared baking sheets, spacing them about 1/2 inch apart; roll out the remaining dough, including the scraps, and cut out cookies. Brush the cookies lightly with the egg glaze. Bake until lightly golden, usually 10 to 12 minutes. Cool the cookies on the baking sheets on a wire rack for 5 to 10 minutes. Transfer to the rack to cool completely. Store in an airtight container for 3 or 4 days. They can be frozen for months.